Weathering steel, best-known under the trademark Cor-Ten Steel, is a self finishing copper-nickel steel alloy. When exposed to the weather, instead of rusting, it's surface crystallizes forming a self-preserving and self-healing rich, dark, purple-brown, suede-like protective finish. Stainless Steel is a high chromium content, rust resistant steel. The surface can be finished by sanding, graining, wire brushing, polishing, or heat patinae. Polychrome is the practice of decorating architectural elements, sculpture, etc., in a variety of colors. The term is used to refer to certain styles of architecture, pottery or sculpture in multiple colors. Powder Coating is a dry painting process. 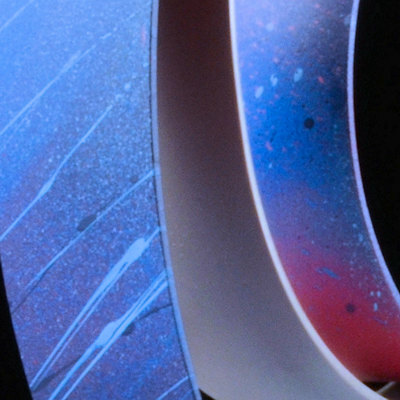 Finely ground particles of pigment and resin are electro statically charged and sprayed onto the sculpture. The sculpture, being grounded, attracts the charged resin powder like a magnet. The sculpture is then placed in an 400 degree Fahrenheit oven, where the powder paint melts and flows into a beautiful and durable finish. Patinaed Steel is carbon steel that has been colored through the application of chemicals that react with the steel to produce surface coloration. The color will vary due to the different qualities of the steel. The colors that I typically achieve run from blue, to brown, to black. Bronze used in sculpture is Silicon Bronze which is an alloy of copper and 2-3% silicon. A patinae may be applied by the chemical application of color accompanied by heat. The patinae is sealed under a wax coating and becomes a permanent part of the sculpture. 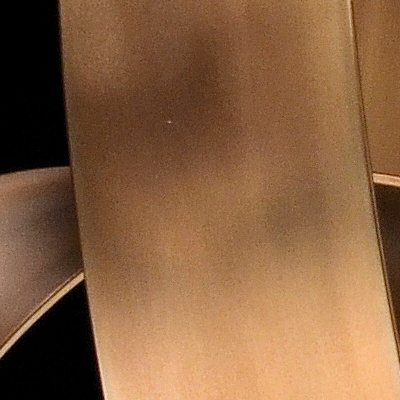 Bronze may also be polished to a mirror finish.